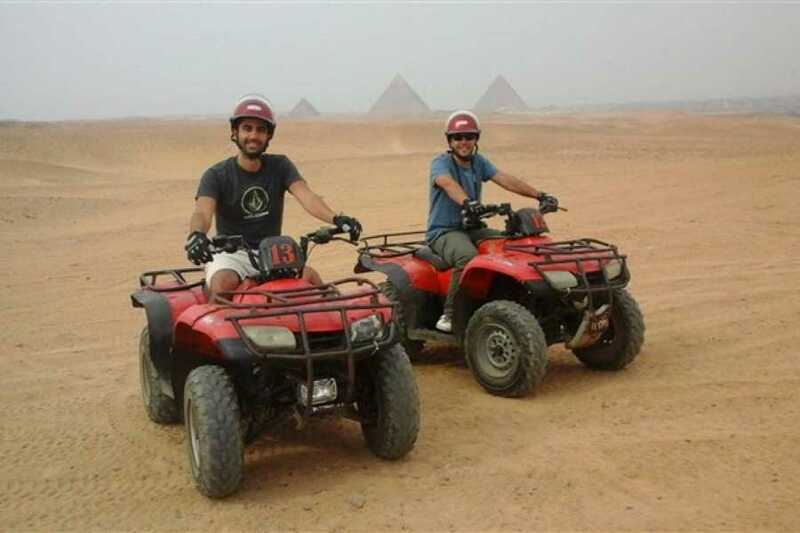 Save vacation time in Cairo by booking for this private half-day Giza quad biking adventure in advance. Prebook to secure your preferred time and date, and travel by private air-conditioned minivan to the Giza Plateau. Then, hop on your bike and after instructions, zoom across the sands and dunes, churning up dust against a backdrop of Giza’s pyramids. Equipment is provided, as is a choice of time slots for flexibility. If you’re an adventurer and you want a unique way to see the Pyramids in Egypt, then our half-day quad biking excursion is perfect for you. 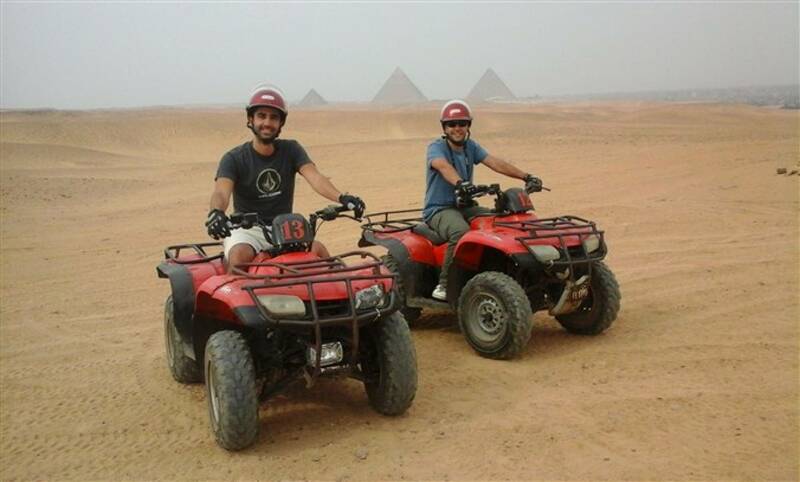 Our tour gives you the opportunity to conquer the desert on a 4-wheel motorbike as you explore the Pyramids in Giza and Feel the sand. The tour starts with one of our friendly staff picking you from your hotel in Giza or Cairo at ( 9:00 am or 10:00 am or 11:00 am or 12:00 Noon or 13:00 pm or 14:00 pm or 15:00 pm) who will be holding a sign of your name at the lobby area, then you will be transferred to Giza Pyramids in an air-conditioned vehicle. Once there, it’s time to jump in one of our Quad bike 250cc dune buggies, which are capable of up to 40mph. You will race your way up and down the dunes, as you cruise into the desert and take in the stunning panoramic views of the Pyramids. Our expert guide will help you take some memorable Pictures for you with the Pyramids as the one appears on your left side. it's not just a tour We assure you that it will be a memory as you fly through the desert with this once-in-a-lifetime adventure. And there’s no need to worry about safety. Our buggies have a full racing roll cage to protect you in the unlikely event of a rollover, as well as a full harness for both seats and wrist restraints.